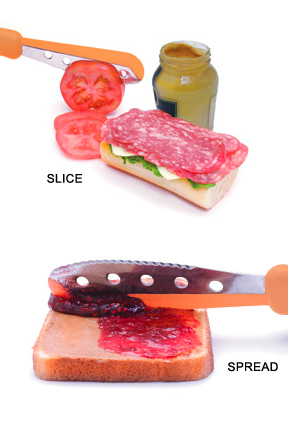 Spachello Sandwich Knife - Slice and Spread With The Same Tool. Slice and Spread With The Same Tool. The perfect tool for cutting a bagel and then spreading on the cream cheese afterward, or and ideal utensil to simplify sandwich making. 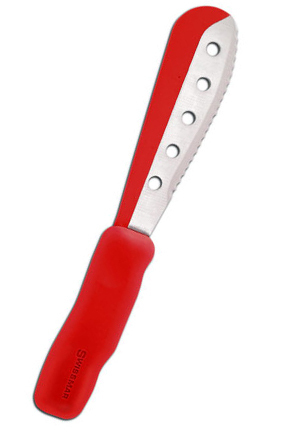 The Spachello is a cleverly designed tool that is actually a combination spatula and serrated knife in one. It can be used by both left and right-handed people to make food prep quicker and easier while cutting down on the amount of cleanup involved. When you slice and spread with the same knife, you only have one to find in the drawer to get ready, and you are left with only one to wash when you are finished. The serrated side is made from stainless steel that is sharp enough to slice tomatoes, breads, cheeses, meats and so much more. Flip it over to the other side and you have an incredibly functional spatula. Made from a high quality, non-stick silicone it makes scraping and spreading easy. Multi-Tasker. Nobody likes washing dishes. This utensil handles more than one job, so you can easily cut down on cleanup. Non-Stick. 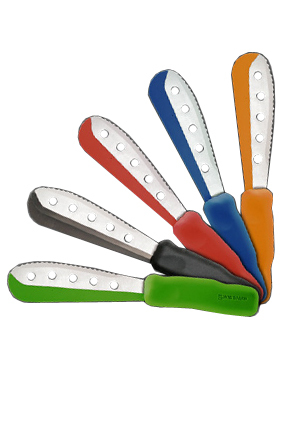 With added holes in the blade, and high quality silicone, food won't cling to it. Slide through cheese without smashing it, and rinse off any residual condiments with ease. Ergonomic. Bigger than it looks, this large tool provides a very comfortable grip. It even has a soft coating and indented finger grips on the handle to add comfort and prevent slipping. High Quality. With a Swiss design and superior craftsmanship, this tool will perform well, and last a long time. Dishwasher Safe. Because even one thing is annoying to wash by hand. Pop it in the dishwasher for easy cleaning when dirty. Thanks to the large size, you can easily slice almost anything, and seemingly impossible tasks like reaching the bottom of a large peanut butter or mayonnaise jar is made simple. The blade also features cut-outs in order to reduce friction and eliminate sticking while you are slicing. The ergonomically designed handle is coated in silicone for a secure and comfortable grip. It's 10.5" long, available in your choice of colors. This is the perfect tool for anyone that prepares sandwiches often. You can use the sharp side to cut fresh bread, slice cheese and tomatoes, prepare other toppings, and then cut your sandwich in half when you are done. The silicone side will allow you to quickly spread on mayonnaise and mustard, or peanut butter and jelly. Since this tool is so long you will be able to easily scoop up every little bit of anything at the bottom of the jar, and then spread it evenly onto a slice of bread. The Spachello Sandwich Knife is great for picnics and camping, but is also the perfect tool to have on hand everyday at lunch time. This combination utensil would make a great addition to any kitchen because it's dual functionality will help you create healthy, hearty and delicious meals with ease. Because it's so versatile you will find all sorts of uses for this great tool. Get it to make sandwich prep a breeze and end up using it for many other jobs too. A spatula and knife in one! Save time and effort by using one tool that can do two jobs. Slice food or spread condiments.